It may be 3 weeks after x-mas, but bragging about astronomically-themed gifts is still in season. 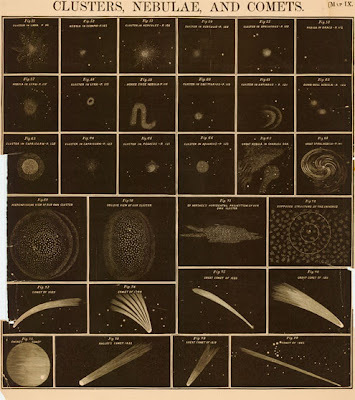 There is nothing quite like a 150-year-old engraving to help you enjoy antiquated notions of clusters, nebulae, and comets. Thanks girlfriend! Update: I forgot the best panel. Here it is, I think it speaks for itself. That's cool. Fig. 56 looks like a snooze-fest, though. Fig. 56 is definitely not a crowd-pleaser. I forgot to put up a close-up of 72 though, which more than makes up for it. I "suppose" if I hit the hyperspace button I'll appear in a random new place on the...universe. Yup. And it would be 1856, like in the picture.